SuperPAC Fundraising Already Dwarfs 2012 Levels : It's All Politics With the first big superPAC fundraising report of the 2016 campaign, it's already clear that this presidential election will be fueled by gargantuan sums of money. The super PAC supporting Jeb Bush has posted some truly astonishing fundraising numbers...and the election is still more than a year away. Independent-expenditure-only committees, also known as superPACs, released their latest funding numbers on Friday, and already it's clear that the committees' roles in 2016 will be gargantuan. The numbers already are far higher than those of the three election cycles since the Supreme Court's 2010 Citizens United ruling, which paved the way for the outside spending surge. For example, there's the eye-popping $103 million that Right to Rise, the superPAC supporting former Florida Gov. Jeb Bush, has raised. That's by far the largest amount raised by any candidate-specific superPAC yet this cycle. At this point in the 2012 cycle, the superPAC supporting Mitt Romney had only raised an inflation-adjusted $13 million. Likewise, Priorities USA, the superPAC supporting Hillary Clinton, has raised $15.7 million — the largest haul for any Democrat in the race. By comparison, Priorities (which also supported President Obama in his 2012 reelection bid) had only raised less than $3.4 million (adjusted for inflation) at this point in 2011. Despite that, Clinton's superPAC haul is being considered paltry by this cycle's standards. Below is a quick look at how fundraising from superPACs supporting individual candidates, combined with campaign totals, looked at this point in 2011, compared to this year. Those are just a few of the many signs of how dominant outside spending groups will be in the 2016 election. For example, consider that superPACs supporting Texas Sen. Ted Cruz, Wisconsin Gov. Scott Walker and Florida Sen. Marco Rubio have each taken in more than Romney's had at this point in 2011, and Perry is just below Romney's mark ... and that three of those candidates (Rubio, Cruz, and Perry) are polling in the single digits. Indeed, Perry's poll numbers may not even merit him a spot in the first Republican debate this week. Then consider that Bush's superPAC has pulled in more than those four candidates' superPACs combined. So there's plenty of evidence that astounding sums of money will fuel the 2016 election. But what does it mean? In part, it means more ads and more competition for that ad space. After all, superPACs are known as "independent expenditure-only committees," and those expenditures include things like ads and mailers that advocate for (or against) a candidate. But it also means a profound shift in how elections are fought. "What you're seeing is a rapid transformation of financing of presidential campaigns, where superPACs — especially candidate-specific superPACs — are evolving quickly," says Anthony Corrado, professor of government at Colby College and an expert on campaign finance. By law, superPACs are not allowed to coordinate with campaigns. But that isn't stopping them from taking on many of the duties traditionally performed by campaigns, Corrado says. "It won't just be advertising, but voter mobilization and identification, starting to build their own infrastructures of supporters in the key primary states, [and] the use of non-candidate committees for issues research and opposition research for issue-related materials," says Corrado. Indeed, the key staffers of many superPACs come from candidates' prior campaigns or inner political circles. One way superPACs are changing presidential races is starting the campaign before the campaign officially starts. As "independent" groups, some of the superPACs were collecting money and spending on candidates' behalfs well before those candidates even announced they were running. Right to Rise, for example, was taking (and spending) donations as early as January. 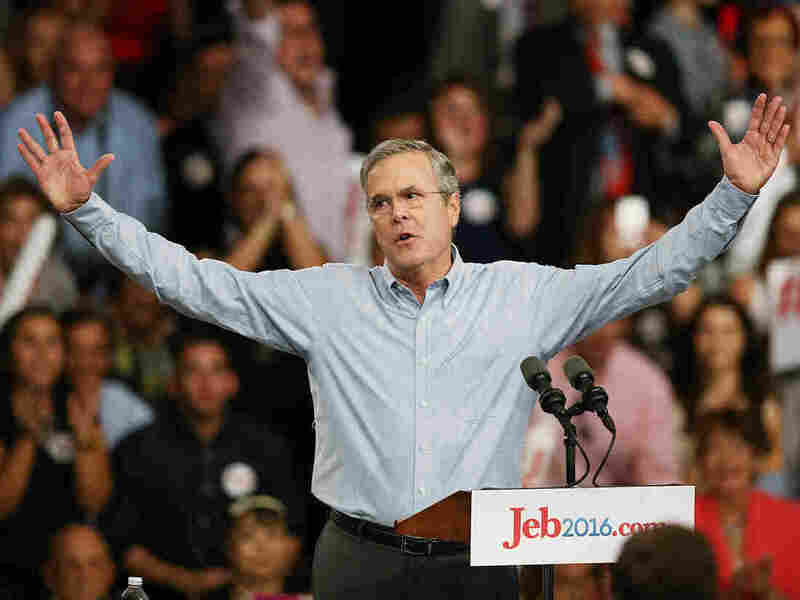 Bush announced his candidacy in June, raising a legal wall between him and the legally independent group. Like many candidates, Bush worked hard to raise money for his superPAC before that point. Heavy superPAC funding could also mean a primary season that stretches on and on, as heavily backed candidates will be able to continue fighting, even if their support is middling. It also means lots of opportunities for people to give — and if they like, to give anonymously. While superPACs disclose their donors, those donors don't have to be individual people; many are limited liability companies (LLC), for example. And it's very easy to create one of those to hide your identity. "If you want me to create an LLC for you, I can do one in 45 minutes, and I can finish my sandwich before I do it," says Karl Sandstrom, who served as an FEC commissioner from 1998 to 2003 and currently is senior counsel at DC law firm Perkins Coie. And some candidates have multiple avenues for donors to choose from. Ted Cruz, for example, has eight superPACs ready to support him, according to the Center for Responsive Politics, a campaign finance watchdog group. It's not just superPACs; other outside spending groups will also play supersized roles in 2016. Like superPACs, groups called 527s can raise unlimited funds but have to disclose their donors. Ohio Gov. John Kasich has heavy 527 support, with one supporting him taking in more than $11 million. There are also 501(c)(4)s, many of which have sprouted up to support specific candidates — and do not disclose their donors. Why so many groups for some candidates? Part of it is that different outside spending groups are taking on different specific roles. For example, Clinton has support from Priorities USA, as well as Correct the Record, a superPAC that exists purely to counter attacks launched at the Democratic frontrunner. With all of the big money flying, it can be easy to forget that the last big innovation in campaign finance involved small donors — the grassroots fundraising that Barack Obama elicited in 2008, before the superPAC era. He duplicated that success in 2012. So is there any room for the small donor this time around? Yes, says Sandstrom — but with an electorate that's disenchanted with Washington, pulling in Obama-level dollars could be tough. "Certainly none of these candidates would pass up the opportunity to raise that sort of money the way President Obama raised it. But I don't think any of them are in a position to do so," he says. "I think much of that effort occurred almost spontaneously, particularly given the technology, in response to a unique candidacy. So I'm not surprised that you don't see the people raising anywhere near that level of money from what appears to be a largely turned-off electorate." One thing is for sure: the money will only flow faster to the outside spending groups from here on out. Conservative fundraising behemoths Charles and David Koch, for example, said early this year that they planned to spend nearly $900 million on the 2016 campaign. TV ad buys alone are expected to total $4.4 billion, with another $1 billion spent online.